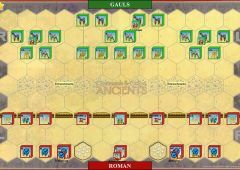 When Caesar resumed his march inland, the Britons united under their newly appointed leader, Cassivellaunus. 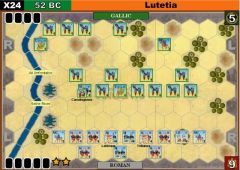 He ordered his troops to avoid pitched battles with the legions. 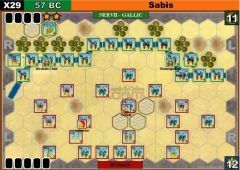 Instead, they were to just harry the flanks of the legions and to attrit the Roman cavalry by drawing them into skirmishes, only to retire after a brief fight. 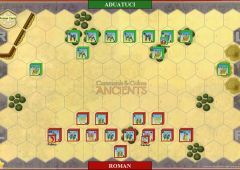 Caesar was impressed with the mobility and open order fighting capability of the tribesman. 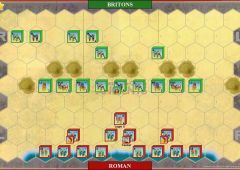 He countered by increasing the size of his foraging parties and emphasizing the need for the legionnaires to support the cavalry. 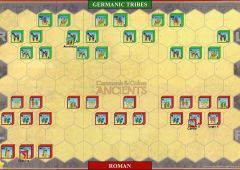 The next Roman foraging party was almost 20,000 strong, with three legions and all the cavalry. 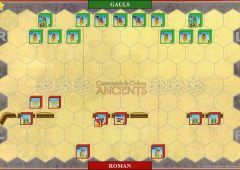 Caesar assigned the legate Gaius Trebonius to lead this detachment. 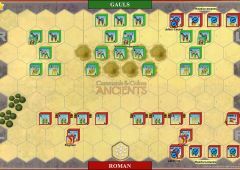 Aware of the large amount of Roman infantry in the column, Cassivellaunus still broke his own rules and attacked – confident that his forces could strike and retire before the legions could close to battle. 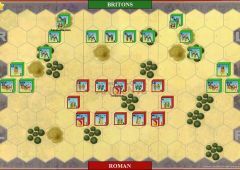 Trebonius ordered a counter attack and the Roman cavalry, closely supported by the legions, broke out of the attempted encirclement, The Roman cavalry then charged home and routed the Britons. 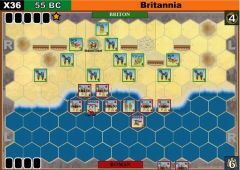 The defeat broke the British alliance of tribes and gave Caesar temporary control of this part of the island. 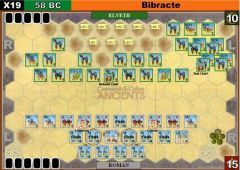 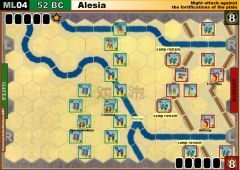 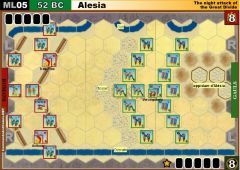 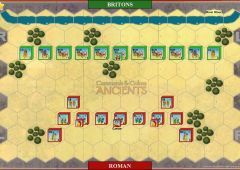 • The Roman player gains one Victory Banner per section if there are no Briton units in a section at the end of the Roman player’s turn. 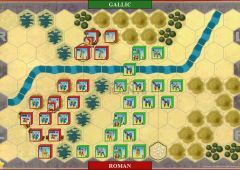 If a Briton unit moves back into the section, the Victory Banner is lost. 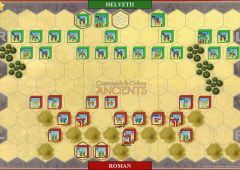 The barbarian chariots brought havoc across the romans lines. 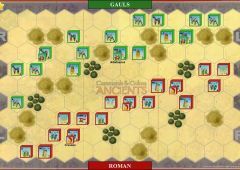 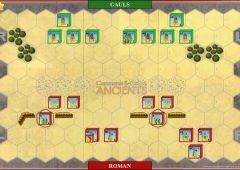 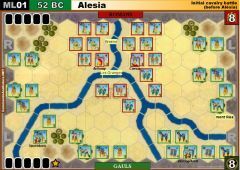 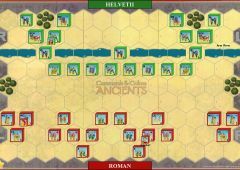 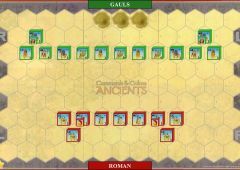 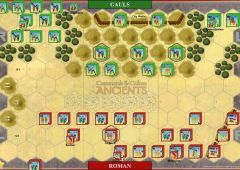 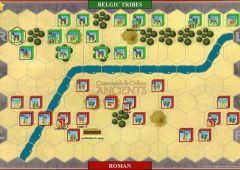 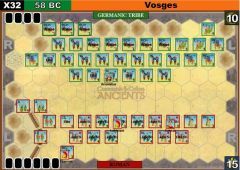 The lack of center cards made impossible for the Roman to advance in the center and use his best troops.